Most visitors' first impressions of Arran are formed by the magnificent mountains that become steadily more impressive as the ferry from Ardrossan approaches the island. 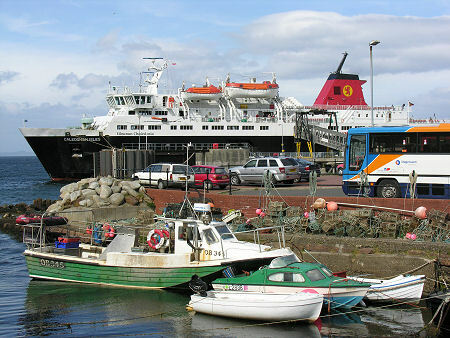 The second impression is usually of Brodick's seafront, and then its crowded and bustling ferry terminal as one set of vehicles disembark from the ferry while another set queues to board. 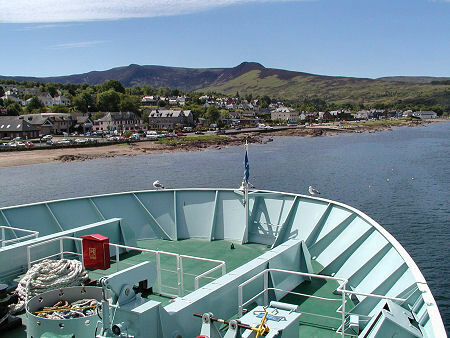 Brodick is usually viewed as the main visitor centre on Arran, though it is not actually the island's largest village or its "capital", being home to 621 people in 2001, compared with the 1,010 living in Lamlash. 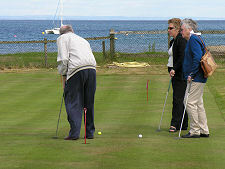 Despite this, Brodick is the focus of much of the recent development on the island. 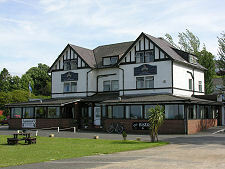 As a result Brodick offers visitors the best selection of services on Arran. 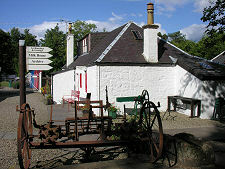 Here you can find, for obvious reasons, the main CalMac ferry office in an attractive brick building on the harbourside. 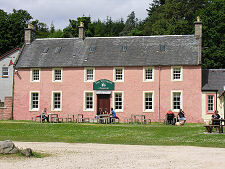 And just opposite is Arran's only Tourist Information Centre located in a building oddly reminiscent of a Kentish oasthouse. Incidentally, just along from the Tourist Information Centre, those in need of sustenance will find a fish and chip shop. 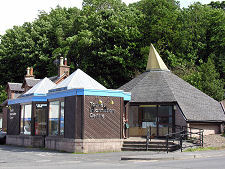 Much of the rest of Brodick is strung out along the landward side of the main road that forms both the promenade and the resort's main car park. Here you will find the supermarket, banks, cafes, shops and hotels around which the life of Brodick revolves. Brodick has sometimes been dismissed by guidebooks as a destination in its own right, and this is probably due to the way the village has cut itself off from the sea with a sometimes very busy road. If only it were possible to lay a proper promenade along the seaward side of the road, using the space now given over to parking, a truly attractive seaside village might emerge from a settlement that at present does have a slightly functional feel. 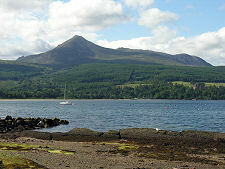 The south shore of Brodick Bay, along which Brodick lies, comprises a fairly narrow band of mixed grass, sand, rock and shingle. At the eastern end, nearest the ferry terminal and literally in the shadow of the new bus station, is a real relic of a past existence. 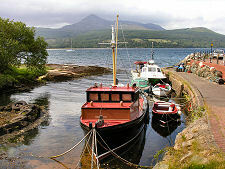 Here you find a tiny harbour of a type that is dotted around Arran's coastline, complete with a couple of small boats. Towards the western end of the village a car park gives access to the west shore of Brodick Bay, complete with an excellent sandy beach and grassy fringe. In many ways Brodick's main selling point lies not within the town itself but in the views from it. 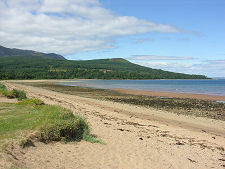 Brodick Bay would be an asset to any seaside resort as it curves around to the north, growing increasingly sandy as it does so. But it's when you lift your eyes from the sea to the mountains above that you really appreciate the location. Dominating everything else is Goatfell, Arran's highest peak at 2868ft or 874m (and, paradoxically, one of its easiest to climb). You can see every inch of the mountain as it rises steadily from the sea to reach its classically sharp summit. In some ways equally impressive is the view as you move your focus a little west from Goatfell, to the lower but implausibly jagged ridges and peaks surrounding Glen Rosa. 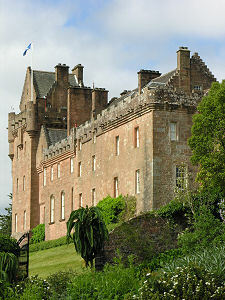 It is only the majesty of Goatfell that prevents your eye being drawn more quickly to what would otherwise be the outstanding feature on the north side of Brodick Bay: Brodick Castle with its formal gardens and country park. 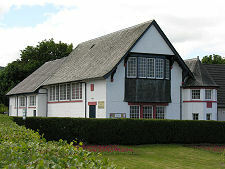 As you drive north from the centre of Brodick you pass on your right Brodick Golf Club, and then the Isle of Arran Heritage Museum set in a complex of converted buildins. A little further on you pass the start of the "string road", the road that climbs over the centre of Arran to reach the west coast at Blackwaterfoot. Beyond this you encounter another of Brodick's major attractions, Arran Aromatics with, nearby and on the opposite side of the main road, The Wineport and its associated shops and services.